This chart will help you translate container sizes for standard Clay or Terracotta Flower Pots giving you an approximation of how much soil each will require. There are few standards when it comes to container sizes and volumes. To determine the size of a pot measure across the top from one side to the other to determine how many inches or centimetres it is. 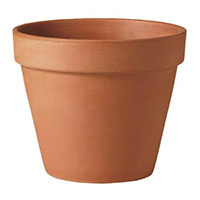 However, because some Flower Pots are long and others are short and because the sides of some Flower Pots are straight and others are tapered, the volume can vary. In all cases Terra Latch Pot Holder will need a lip at the top of the Pot in order to hang and click in place. 1 Terra Latch is required for a single Flower Pot. 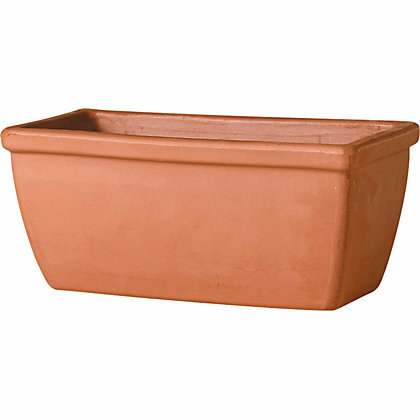 You can also hang Terracotta Troughs using a Terra Latch every 30 centimetres. There are no limits to how wide or long the Terracotta trough can be. Each Terra Latch can hold a maximum 40 kilos in weight. When it comes to filling a pot with soil estimating how much soil you need is an approximation. Often the volume of a container is measured in litres, but, of course, when you purchase soil you are purchasing dry (potting soil is not liquid). A dry quart is equal to about 1⅛ liquid quarts. When deciding how much soil to purchase it’s best to factor soil compression that commonly results from moistening and pressing the soil into the pot. Soil compression can add another 15 to 20 percent dry soil to the Flower Pot. Also take into consideration that when you transplant a plant from one container to another, you will be moving some soil around the roots of the plant. Take notes on the Flower Pots you have and the soil they require so you will have a realistic estimate of how much soil you will need to purchase when potting plants.